As I’m sure you’ve gathered by now, crespelle is Italian for crêpes. 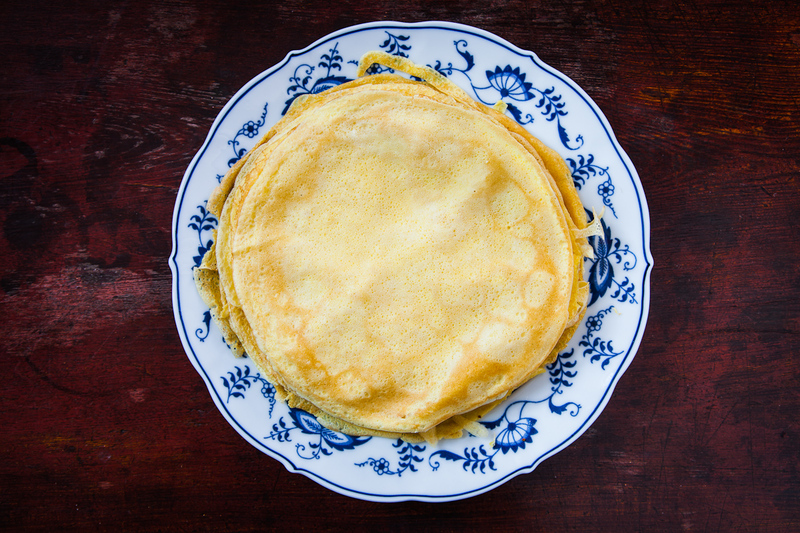 Cooks of a certain age might recall a time in this country when crêpes were ubiquitous. There were Julia’s famous crêpe recipes, including the Gâteau de Crêpes à la Florentine, which she translates in Mastering the Art of French Cooking as a “Mound of French Pancakes Filled with Cream Cheese, Spinach, and Mushrooms,” essentially a stack of crêpes layered with all the aforementioned ingredients in an ovenproof dish, covered with, as Julia puts it, “a good sauce,” (read, Mornay) and then baked. Yikes! Now you know what fueled the sales of all those Jane Fonda workout videos. Diners of the 1980’s will also remember the Magic Pan restaurant chain with its revolving carousel of inverted crêpe pans and dirndl-skirted waitresses (just the pans were on the carousel, not the waitresses). Fancy stuff. For Main Street America, just getting its culinary sea legs in the 1970’s, crêpes were an easy introduction to “European gourmet” food. People who wouldn’t have dreamed of putting a cuisse de grenouille into their mouths (let alone sea urchin roe) happily chowed down on those skinny French pancakes. Despite Julia’s translation, crêpes really aren’t pancakes. Pancakes are thick, burly American things; crêpes are slender, delicate creations from the country where women don’t get fat–not that anybody knew that in 1982. And then crêpes disappeared (rumor: they ran off with the fish poacher). I think they were too strongly identified as “beginner” food–and who wants to be thought of as a novice? It was as though everybody shifted into the culinary passing lane and zoomed away in truffle oil-propelled jetpacks. But they’ve never really disappeared from casual cuisine in Europe, or in tiny themed cafes here, where you can still find them rolled about creamed crabmeat or chicken or spinach or mushrooms and Gruyère, all good stuff, the base for a light (reasonably) savory meal, or as here, a component in an unfussy dessert. Set aside 1 tablespoon melted butter for cooking the crespelli. Use the rest in the next step. 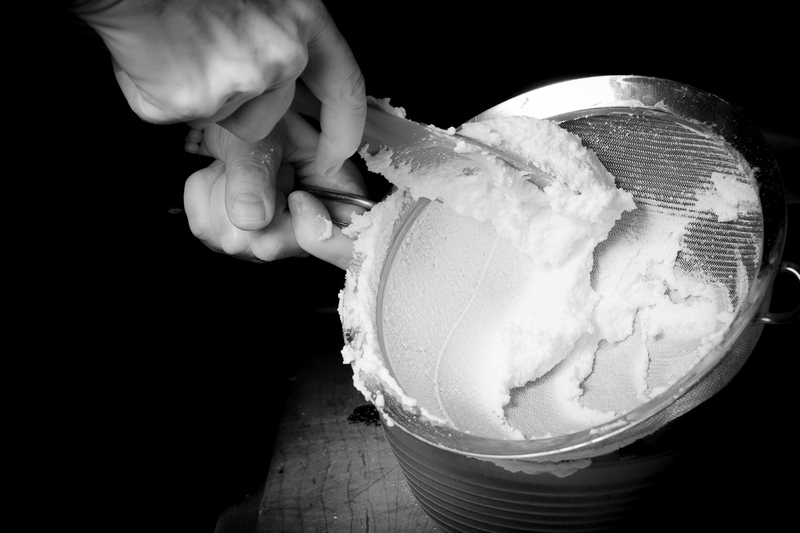 Combine the milk, water, eggs, flour, ¼ teaspoon salt, and 1 tablespoon confectioner’s sugar together in a blender. 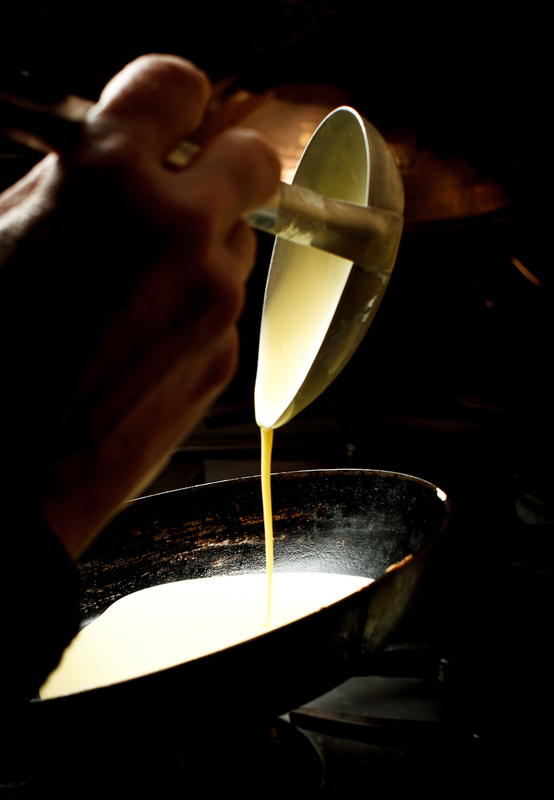 Blend until smooth, adding the butter in a steady stream. 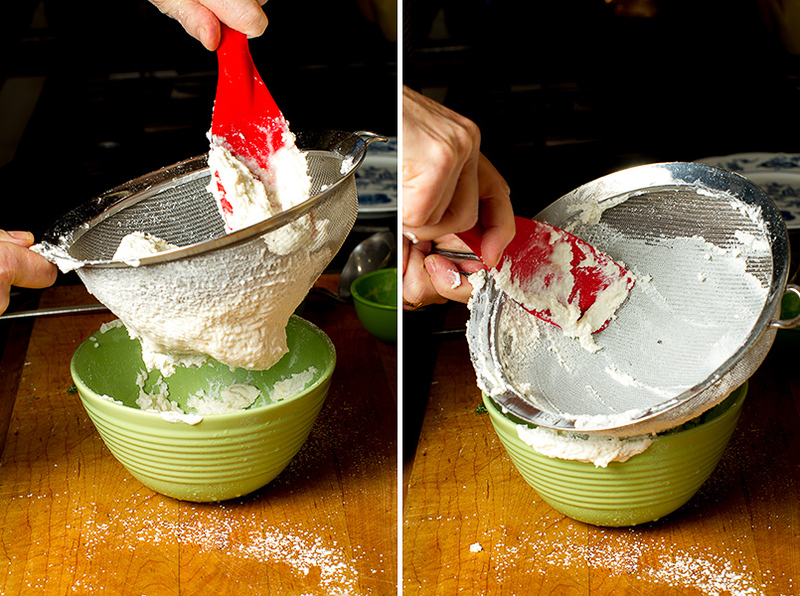 Pour through a strainer to remove any lumps. Let sit 2 hours. It should be the consistency of heavy cream. Add more water if necessary. 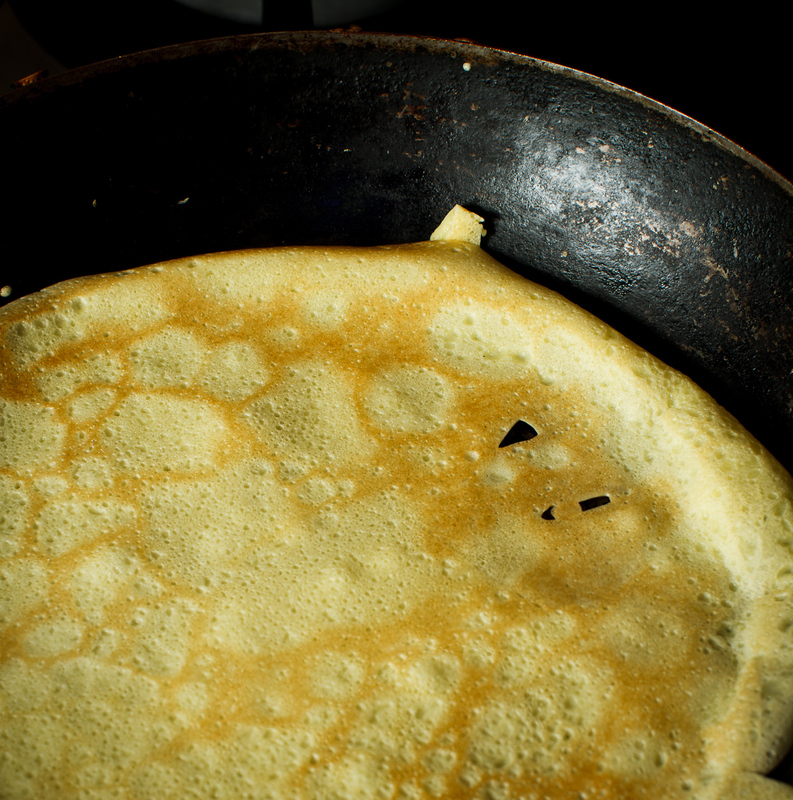 Brush a small non-stick sauté pan or crêpe pan with butter and heat over medium heat. Tilt the pan toward you. Ladle an ounce of batter into the pan at the highest part of the cooking surface. Tip and tilt the pan to completely coat the cooking surface. 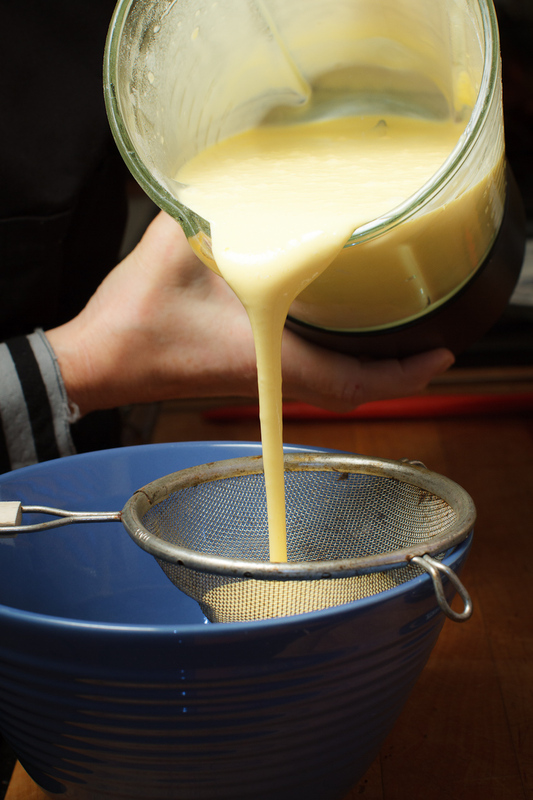 If the batter doesn’t flow easily, add a little more water to it. Put the pan back on the burner. 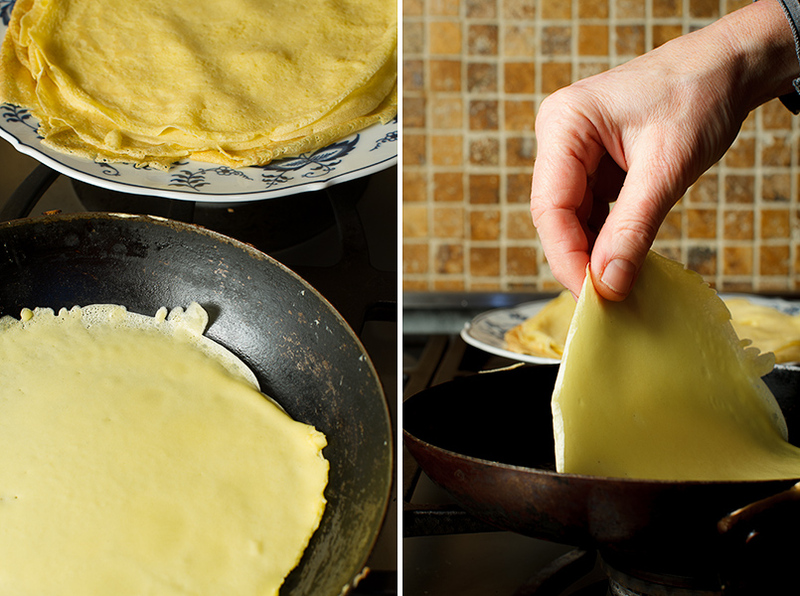 Cook about 30 seconds then lift one edge of the crêpe with a spatula and use your fingers to flip it (you can see this in the photo). Let it cook about 10 seconds on the second side, then slide it on to to a nearby plate. Continue cooking the crêpes and stacking one on top of the other until the batter is gone. Mix the ricotta with the remaining salt, ¼ cup confectioner’s sugar, and the honey and then push through a strainer to remove any lumps. Add the rosemary to the strained ricotta. 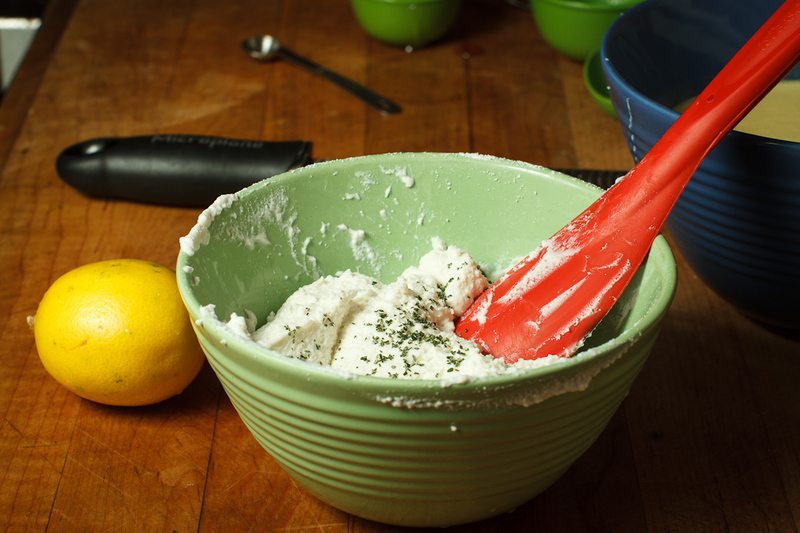 Grate the zest of the lemon into the ricotta, then squeeze 2 tablespoons of lemon juice into the mix. Stir everything together, taste, then add more lemon juice if you want more lemon flavor or a bit more tartness. 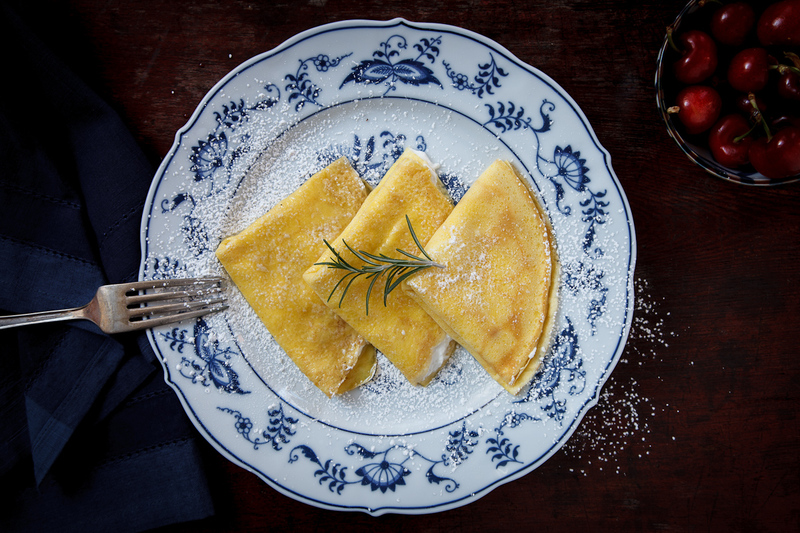 Spread 1 tablespoon of ricotta over each crêpe. Fold into quarters. Arrange on a platter. Serve at room temperature. Just before serving, sprinkle with confectioner’s sugar. Jody Notes: This simple dessert was served to us in Puglia. I didn’t watch the chef make them and I didn’t get a recipe so I had to work out my own version. Rosemary seemed like a nice compliment to the lemon. The batter I make has a high ratio of eggs to flour, resulting in crespelli with a very tender texture and a rich flavor. 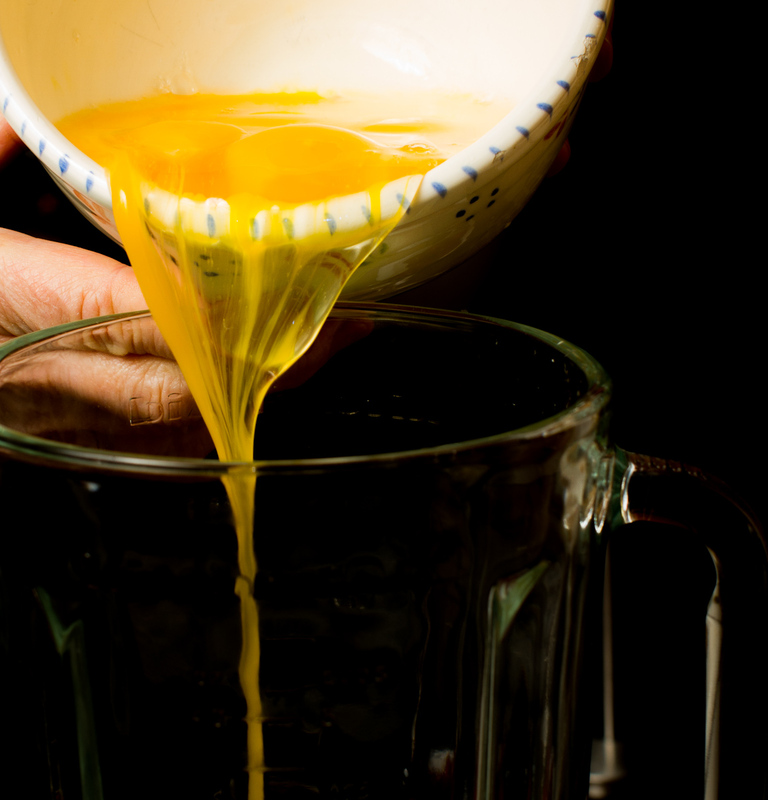 I always thought that the recipe I’ve relied on for years was an adaptation from Julia Child, but in preparing for this post I went through her cookbooks and couldn’t find one with this many eggs. In fact, hers have only 3 eggs (for the same amount of flour, I use 5), less butter and more liquid. But James Peterson came through in Glorious French Food with an even higher ratio than mine. 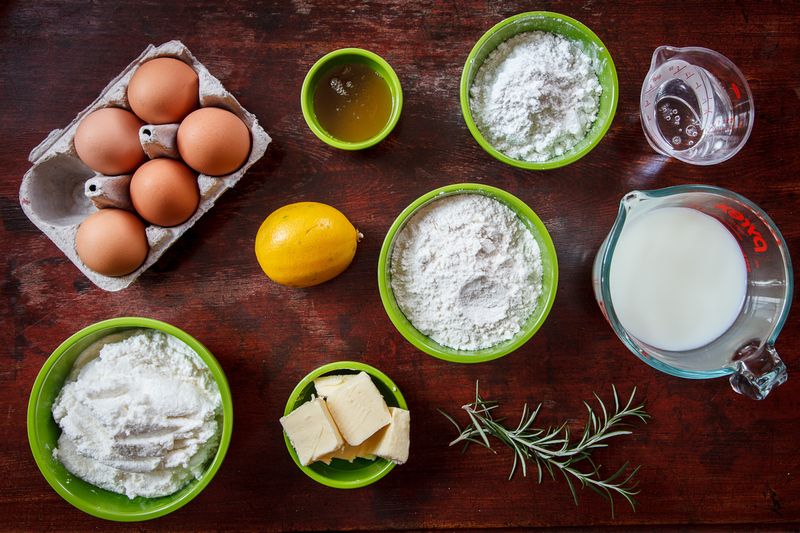 If you have a favorite recipe, go ahead and use it; otherwise, following me down the middle path is a good place to start. This entry was posted in Dessert, Easy and tagged crêpes, crespelli, Julia, lemon, Puglia, ricotta, rosemary, sweet. Bookmark the permalink. 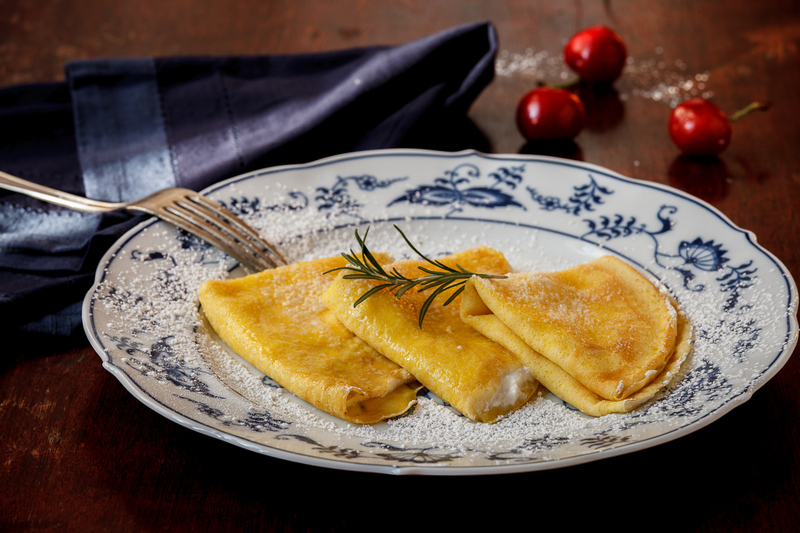 I love the Italian name Crespelle, sounds cute! I had not come across it before, although am familIar with crepes of course! Ricotta, rosemary and honey – nice combination, rather decadent in fact. I cooked the British version for my girls for breakfast this morning – the good old pancake – different from the US version. 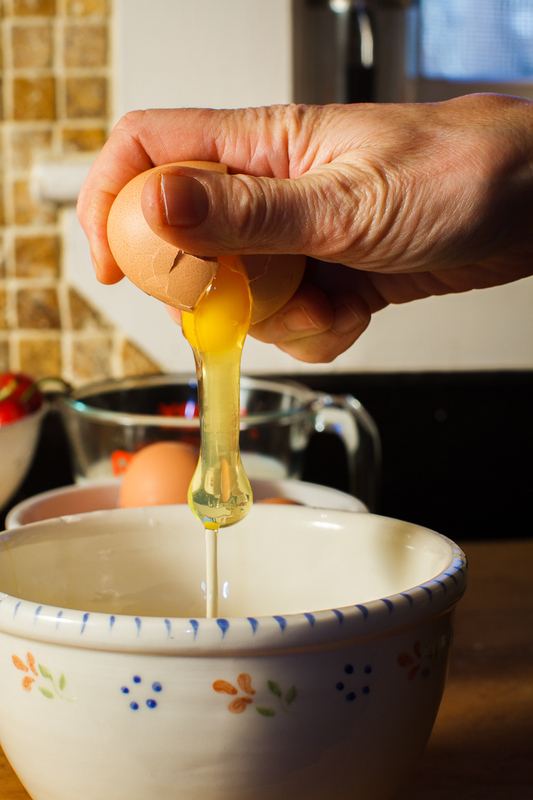 1 egg, 100g flour, half pint of milk = whisk and then a little olive oil in the pan then pour in a little of the mixture. Once cooked and turned once, sprinkle with sugar and lemon juice. Voila. A pre school treat if we are running ahead of time. Your version is definitely the grand-dame of them all so will give it a shot. Best Torie ps: I like the pouring the egg shot. Turned out well. Too funny Ken. Can you be around people with nut allergies? Great minds think alike. 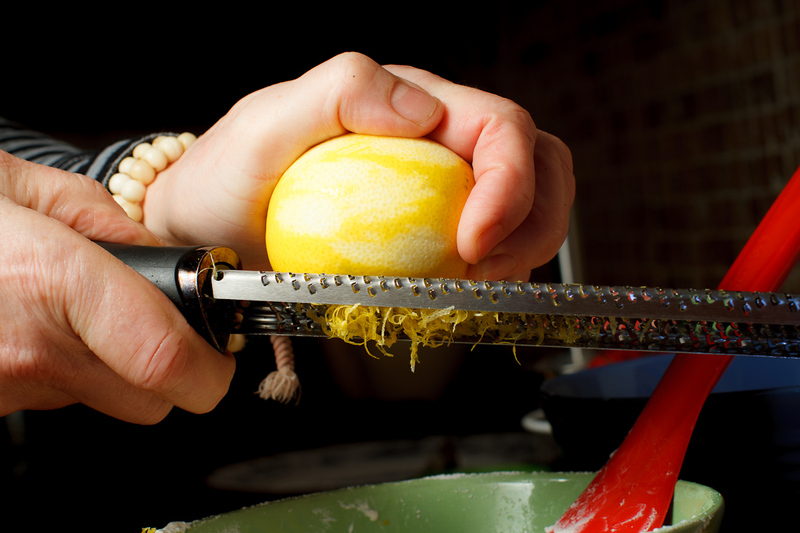 When life gives you lemons, use them, preferably for dessert! Check out the message I sent you Garum’s FB page conveying our cousin’s memory of an unforgettable lemon dessert she had at Rialto. BTW, D#1 is also a huge fan of crepes (no matter how you spell them), so this recipe will be a winner as far as she’s concerned. I won’t even wait for a sad occasion to give it a try. Looks so delicious. Would you come to our house and make them? Please, please, please. P.S. These guys are EASY. The aforementioned chicken is grad school, by comparison. Easy or no, looks so delicious! Superb, that meltingon the Tongue. . .
Ken, why didn’t you go to NYC? Well Ken, that’s the first laugh-out-loud recipe I’ve ever encountered and your photographs are fabulous so I had to comment. Thanks! Your mother-in-law. This looks absolutely divine. Omg. That is a recipe I am definitely going to have to try.